Right, last game of the first day, and the previous match has drained a good part of my energy! I was hoping for a laid-back third game, but then the news hit me: having won 2/2 rounds, we were paired against the current leaders, none other than the second half of the ETC team France! Our leader, jaina, worked his magic (read: shoved me under the bus to get some other favorable matchups) and I ended up facing the captain of the ETC team, Ankor, and his shooty Highborn Elves. 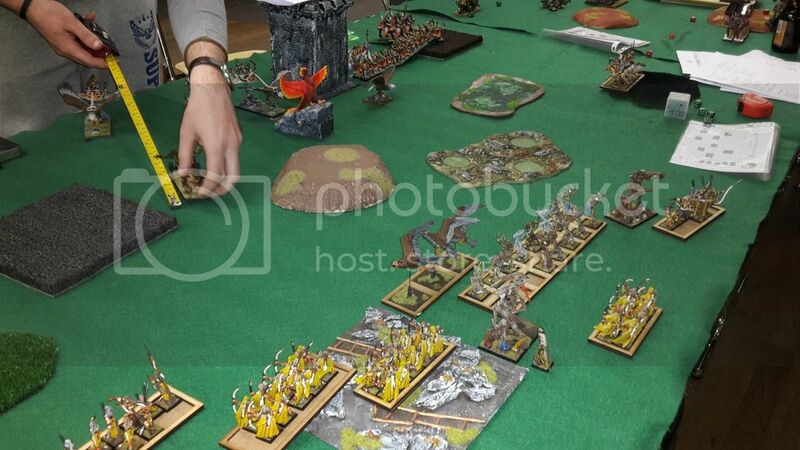 In all fairness, the other armies were also quite scary: 2-organ gun dwarves, Magic heavy 2-EDC WoDG and Dread Elves with good magic (alchemy) and full shooting + 2 big blocks with Altar. So better mobility, more shooting, and two hard counters for the treefathers in the form of Divination magic and the Royal Huntsman Prince. The deployment type was counterthrust this time, with the secondary objective being Breakthrough. Both of these were bad news: the counterthrust meant that the alternate deployment denied the option of grabbing the first turn, and the breakthrough was bad because of the two scoring cavalry units. 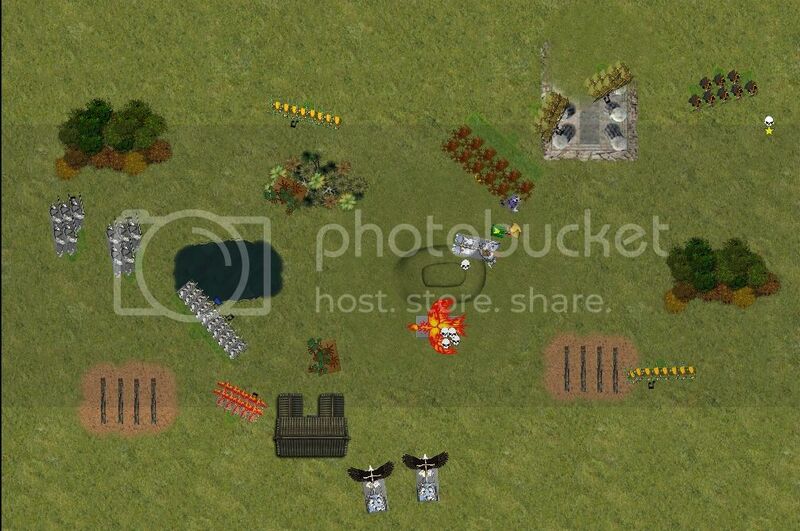 Overall, the plan was to neutralize the Phoenixes and the Skysloops with my shooting, stall and keep the lion prince occupied while the treefathers pushed for the Archer bunker. Easier said than done. Thibaut gave me the first drop, meaning that by the end of our deployment he still hadn’t dropped his archers. In the end, he went for a denied flank with the archers right opposite my –relatively- empty flank, but also safe from harm. Knowing I’d get a +2 to play first, I gambled deploying in a position where I’d be able to kill one of the cavalry units by concentrating sylvan archer and pathfinder shots, then focus on the chariots. For magic, I got Spirits of the Wood and Summer Growth while my opponent got Scrying, Fate’s Judgment, Stars Align and Unerring Strike. Rolling for the first turn, I failed once more to seize the initiative. TURN 1 – Highborn Elves. The phoenixes and chariot prince pushed forward, while the Skysloops and the cavalry to the left maneuvered behind the hill, leaving me horribly out of position in terms of shooting. On the right flank, the archers moved a bit closer to my lines and the second unit of highborn lancers started a slow advance towards my deployment zone. In the magic phase the Unerring Strike on one of my Treefathers was dispelled, permitting the Wizard Master to cast the Stars Align on the archer block. Shooting was focused on the Wild Huntsmen, wiping them out with ease. The skysloops failed to impress, being out of range from the juicier targets. With the chariot prince 2 turns away from my lines, I figured that I needed to focus my energy on killing the birds and on weakening the prince a bit: at 2 wounds or so, I could hope to kill him with a bladedancer charge, and he’d definitely become more cautious. So the treefathers moved up a bit, threatening the advance of the chariot prince, the bladedancers on the left played chicken with the phoenix and chariot while the archers readied their arrows for their –now- only targets. In magic the Throne went up. 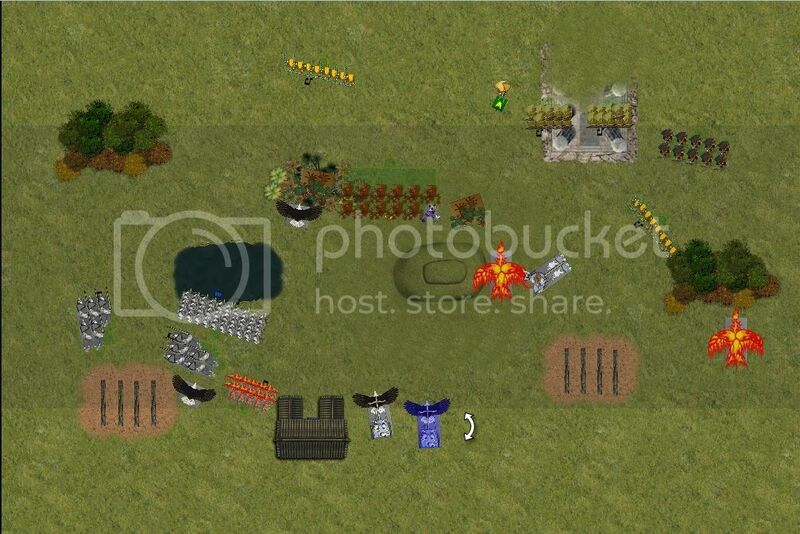 The sylvan archer shooting was aimed at the Phoenix on the far left, only managing a single wound on the beast. The pathfinders managed to put a wound on the chariot prince using perforating shots, and the rightmost archers took a wound off the closest skysloop. 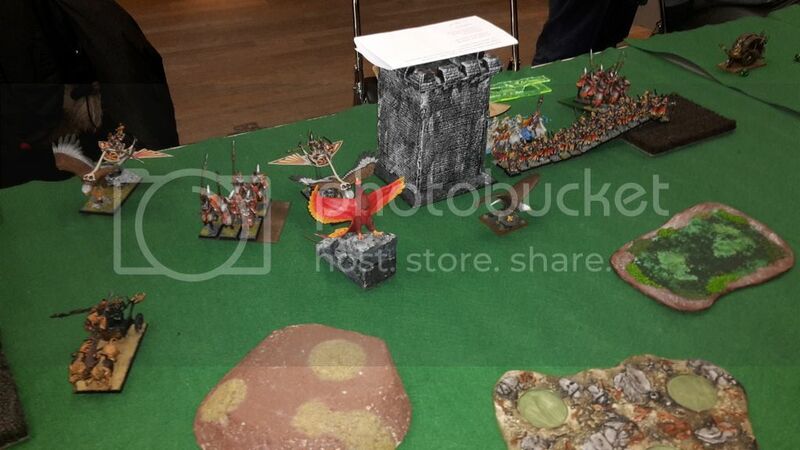 The phoenix on the left advanced a bit towards the bladedancers, the Prince sped forward towards my lines and in the middle the second phoenix scaled the hill ready to charge on the following turn. The archers and skysloops edged a bit forward too, while the highborn lancers continued their long path towards my deployment zone on the far right. Magic was one of the same: unerring strike dispelled, allowing the stars align to be cast on the archer unit. Shooting didn’t do much this turn due to the fact that the only eligible targets were the treefathers at long range, behind a forest. So, here is where I miscalculated things a bit: I figured that I’d be able to put a second wound on the prince with the pathfinders, while the combination of the treefather’s roots, 30 sylvan archers and some dryad toxic spores would be able to kill the phoenix on the hill, or at least cripple it. I figured that the treefathers were pretty much impervious to the enemy bows, so the right hand treeman rushed towards the archer bunker. To the left, I sacrificed the Kestrels by using them as chaff (should have brought an eagle!) to delay the chariot prince, and tried to set up a trap for him: the bladedancers, treefather and the shapeshifter all ready to countercharge. In the magic phase, the matriarch managed to cast Spirits of the Wood on her unit, granting them steadfast and preventing any cheeky charges by chariots/ phoenix. The two attempts to move the treefather inside the forest closer to the archer block using Treesinging were dispelled. Shooting was abysmal: the combined efforts of the sylvan archers, dryads and treefather amounted for a single wound on the middle phoenix! The pathfinders failed to wound the unkillable prince (in hindsight, the prince was a very bad target for them due to his Bluffer’s Helm) . No more photos from now on, so I’m going by memory: The chariot prince and Phoenix tag-teamed the kestrels, wiping them out in combat; The prince reformed to face my bladedancers, denying them the flank charge. The leftmost phoenix now moved up and burned a couple of dancers with its sweeping attack. The archers moved back a bit, while an eagle was sent in front of the treefather. Magic was one of the same, yet again: Unerring Strike dispelled, Stars Align cast. 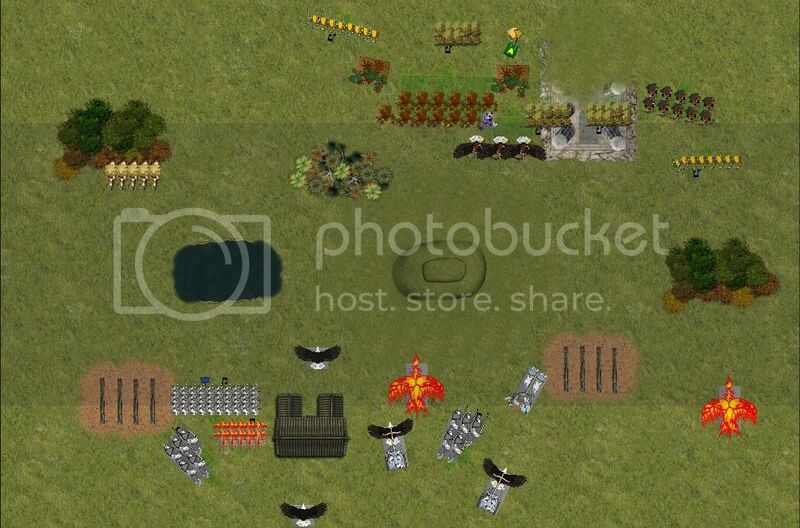 Shooting was focused on my rightmost archer unit, wiping them out completely. The treefather took a couple of wound from Queensguard fire. Having seen what the prince was capable of, I doubted my plan: I chose not to charge in with the Treefather + bladedancers, and instead decided to try and rush the bowline with both treefathers. The bladedancers started moving towards the enemy lines: as long as I took care of the phoenix I’d have enough time to rush the archers into the deployment zone too and score the objective. Magic succeeded in restoring the wound on the treefather, the rest getting dispelled. 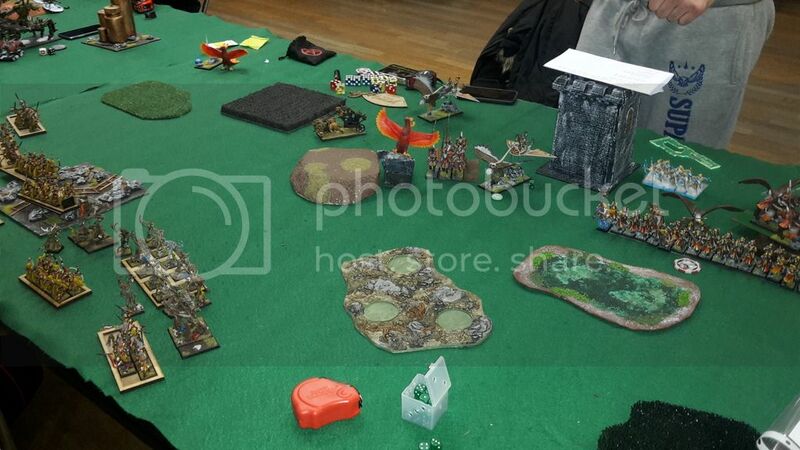 Shooting was yet again focused on the phoenixes: this time, the bird in the middle took 3 wounds (my opponent saved 4 wounds on a 5+) while the pathfinders scored a couple of wounds on the leftmost phoenix. The treefather to the right killed his eagle and reformed to face the archer block once more. 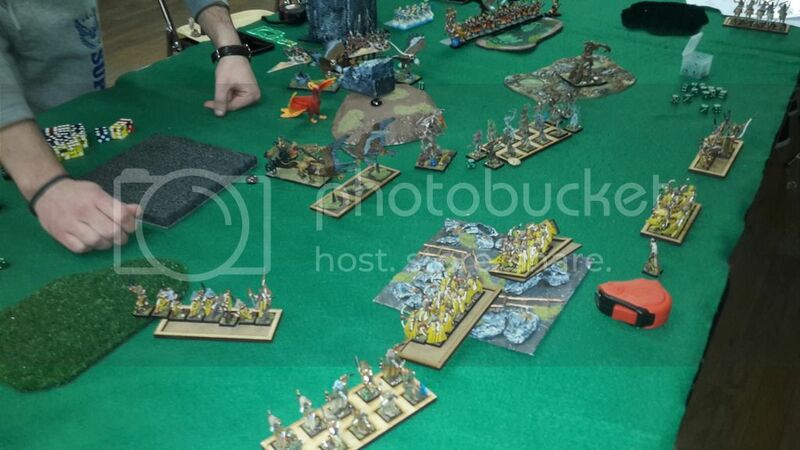 Still no charges from the highborns, the chariot prince was out of position after last turn’s maneuvers. He now switched his attention to the right flank, moving towards my treefathers. The middle phoenix ducked behind the hill, while the left one flew over the pathfinders, killing two of them. The second eagle was thrown right in front of the treefather too. In the magic phase the Archmage miscast the Unerring Strike on 5 dice: he caused a wound on my left treefather, and thanks to a good miscast roll, he only killed 8 of the archers. No lost spells, no lost wounds... Shooting did another wound on the same treefather and also dropped a couple of bladedancers from the right unit. I retaliated by charging the second eagle with the treefather to the right, hoping for a failed terror; It was not to be, the bird bravely took the charge. The left treefather moved into position for a turn-five charge. The shooting contingent turned their attention to the phoenix once more. Magic saw me heal the treefather to full strength, and shooting finally managed to kill the left phoenix. The remaining arrows were directed at the prince, failing to pierce his armour. In combat the second eagle was dealt with: with no more chaff, the two treefathers would have 2 turns to try and get some points. Here is where it all went pear-shaped: it all started at the end of my turn, when the phoenix succeeded its test and rose from the ashes. Then, the Prince on chariot spotted my treefather inside the forest, and succeeded in charging him on a 10+. He also warded the one wound he took from dangerous terrain. The reborn phoenix performed a sweeping attack over the pathfinders, killed 2 and panicked the rest off board. His counterpart spotted my bsb (who had moved up to support the treefathers in the upcoming combats), flew over him and did 3 s4 wounds. Enter 3 failed 4+/4++ saves and a very dead BSB. Moving on to combat: the prince did a single unsaved wound to my treefather, which multiplied to 2. The crew and lions failed to wound, which meant that my tree got to hit back. Being in the forest, I had rerolls on 1’s to wound; So I figured that the best chance I had was to try and crush the prince. I failed to hit. The treefather then failed his ld9 stubborn test and ran, getting cut down in pursuit. And this, kids, is how I managed to lose 2011 victory points in one (very improbable) turn! 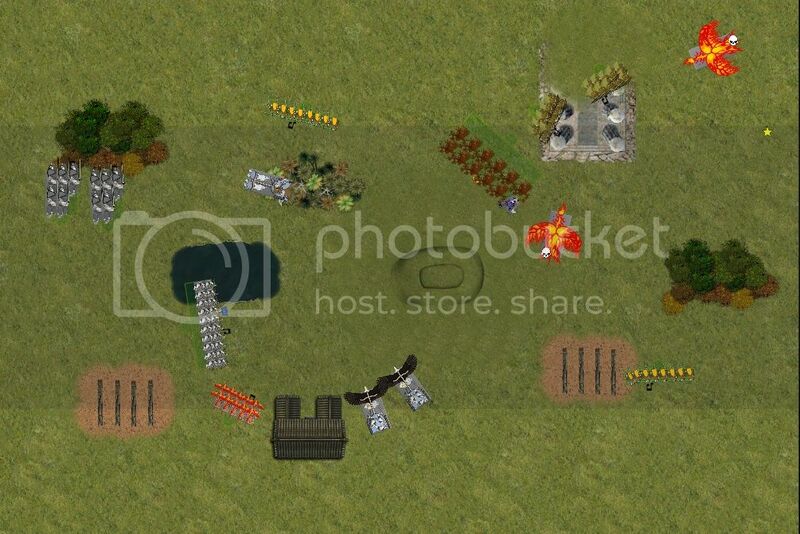 Predictably, I didn’t manage to make a comeback after my opponent’s fifth turn: in the end, I just killed the two phoenix with my last two archer blocks and my opponent grabbed the objective by rushing his cavalry into my –now empty- deployment zone. In the end, the game was a crushing defeat for me: 18-2 in favor of the highborn elves. This is a game where dice did not help against a very good opponent who played a good, safe game with a superior shooting force. 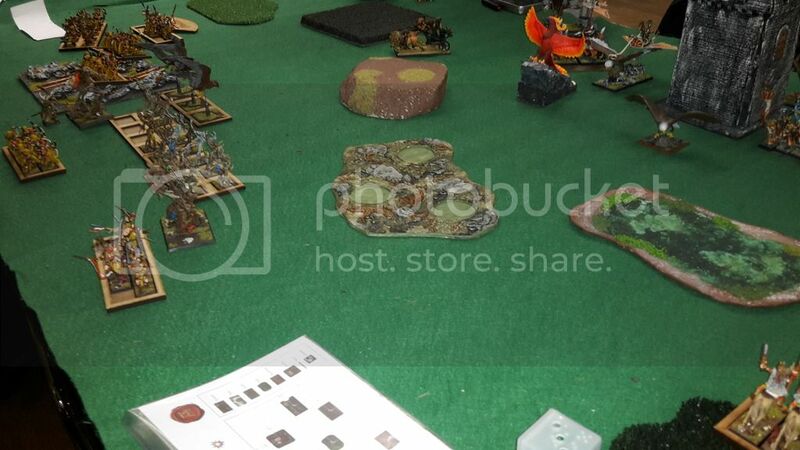 The pivotal moment was probaby the first turn: I should have rushed aggressively with both treefathers and practically every other combat unit I had towards the archer block, in hopes of getting some points from the soft elves. There were a number of instances where the tables could have turned (for example, a single failed terror test on an 8 from one of the blocking eagles), but the game was my opponent’s to lose, ultimately. Thankfully, the rest of the team did better which meant that the effect of my defeat was lessened: with two small wins, one draw and one big loss (mine), we ended up losing the round by 2 points (38-42).